A new member of our Medical Team! Today was our four-month checkup with the Orthopedic Surgeon – but, today we met our new Doctor, Dr. Li. As I’ve mentioned before, after years working with Dr. Vanderhave, I was nervous that our new Doctor and I wouldn’t see eye to eye. Everyone knows how leery I am of surgery for my children, but Dr. Li really put us at ease. We liked her instantly. She spent a lot of time discussing the surgery and the pros and cons with us. When we left, my daughter said that she not only liked Dr. Li, but that she felt less nervous about surgery because she felt like she was in good hands with our new Doctor. I know that it’s tough to make a judgement call with one meeting, and a Doctor’s credentials have to be a deciding factor in how competent they are, but I had done that research ahead of time and will continue to learn more about Dr. Li by talking to other parents of her patients. In the meantime, we breathe a sigh of relief because we feel like we continue to be in great hands. The University of Michigan Hospital system is first rate, and Dr. Li fits right in. She even has some research developing in the area of pain management after surgery – it could hold a lot of hope for us in the future. Dr. Li really urged us to consider surgery sooner, rather than later (around age 11 or 12 – our daughter is currently 11). But, she backed up her recommendation with great answers to many of my questions. And, I had a lot of questions! Our balancing act is that at 71 degrees (which my daughter measured today), we run the risk of her curve spiraling out of control when she hits her pre-puberty growth spurt (that most young girls experience in the year or so before menses). Her lower (lumbar) curve has gotten a bit better over the years. When we first started this battle, her spine was essentially an S, with the lumbar and thoracic curves being almost equal. But, now her lumbar is not very noticeable, but her thoracic spirals way to the side. Dr. Li is recommending a fusion up to T1 because she worries that as she straightens the thoracic, that her upper thoracic area, and into her cervical area (neck) will curve to compensate. Fortunately, the thoracic spine is the best part to fuse because she will not experience a lot of mobility constraints. It’s the cervical and lumbar parts of the spine that need to bend the most. I can tell that the Lord is bringing us peace and acceptance because my daughter and I got through it, and the rest of the day, without crying. In fact, we are starting to achieve peace about it. I still mist up when I think of her coming out of surgery, in such pain for days afterward, with a slit all the way down her perfect, young back. But, it also pains me to see how her shoulders are starting to become misshapen and a hump beginning to form on her back. Either way, this disease will be hard – I’ve always just tried to navigate which hard to choose. And, I will never know what the perfect decision is or if it will work or not. It becomes a well-informed guessing game and a walk in faith – nothing about Scoliosis treatment is one-size-fits-all. We will see where this road leads. Thank-you all for your support in our adventure! Every year during the Lenten season, I, like many Christians, really focus in on the strength and sacrifice of Christ. If you have read my blog for any length of time, you will know that I find much of my strength from my relationship with and my love for God. If you don’t share those beliefs, I love you anyway and hope that you can still find peace with my more technical posts about Scoliosis. But, dealing with any illness with our children is not just about scientific facts and figures. It is also about our spiritual and mental health. Any Mom or Dad will find her or himself washing away in the tide of anxiety concerning her or his children, but a Mom or Dad with a child dealing with a chronic illness? Well, that high tide becomes a tsunami sometimes. I was sitting in church last week, listening to our Pastor talk about anxiety in his current sermon series “the fight for joy”. You can follow his blog here. I like to think of myself as a “reformed worrier” because I have always been a nervous, tense, worrying creature my whole life. But, over the years, I have had to repeatedly rely on my trust in Christ to help alleviate that affliction. There is no better way I can think of to cope with the anxiety surrounding my children’s illness than this. Phillippians 4, Vs 6 states: “The Lord is at hand; do not be anxious about anything, but in everything by prayer and supplication with thanksgiving let your requests be made known to God. And, the peace of God, which surpasses all understanding, will guard your hearts and your minds in Christ Jesus.” What a great reminder, as I head into the season of Lent, and as I deal next week with a great source of anxiety for me – our quarterly checkup with the Orthopedic surgeon. And, this time with a new Doctor! Oh, I could list here the anxieties that go through my mind – including, will she insist we have surgery right away or respect our attempts to wait as long as possible? And, don’t get me STARTED on my anxieties about surgery! But, I have to remember and to meditate on these verses and remember that God loves my kids more than I do (hard to believe) and that he also loves ME and no matter what will be by my side, if I only let him. I often tell my friends, especially those that have not yet had children, that with all the tools we need as parents, I think that faith in and a relationship with God is the most important tool. And, for control freaks like me, it’s downright liberating to have such a faith. When you are feeling anxious about anything, remember that God’s peace is there for you – you don’t have to deserve it or earn it or “make it happen”. Just communicate with him – plead with him, if you will – but the peace will come if you let it. And, no matter the outcome, even if something bad happens, there is no way we could have prevented it by worrying anyway. Plan for your kids, do your research, take necessary proactive precautions. But, turn the worry over to God. A warm view of cold lasers. A new customer/friend of mine told me the other day that she is planning to try cold laser treatment for her back pain (resulting from Scoliosis). A friend of hers had undergone such treatment and experienced almost instant relief from severe sciatica pain. Although I have not heard how her experience went yet, I will say I was intrigued by the cold laser treatments. I had never heard of them before and wanted to learn more. Cold lasers, also called LLLT (Low Level Laser Therapy), low power lasers, or similar names, are different from the lasers used for surgical intervention. They are also sometimes called biostimulating lasers because they work at a cellular level. Proponents of the treatment claim that these lasers are able to go through the skin and deep into the cells. They then cause a biochemical change in the cells, which help to stimulate normal cell activity in a cell that may be compromised or inhibited due to an injury or other trauma. This change in chemical makeup of the cell may lead to a reduction in swelling, pain, and accelerate healing. This sounds amazing and got me to thinking – is this bringing us one step closer to the handheld healing devices ala Star Trek, or is this one more not-so-effective remedy? One study, published in the European Journal of Scientific Research in 2009, asked this same question. The experimenters performed a study on 30 patients with chronic lower back pain. They separated them into a laser treatment group and a placebo group. Each group got treatment 3 times a week for 4 weeks. The laser treatment group had significant relief of symptoms without negative side effects. There was a statistically significant difference between the pain relief experienced between the two groups, with the laser treatment group experiencing much more relief than the placebo group. Now, more studies definitely need to be done, and on a larger scale. And, there are many more studies out there, which I did not have the time to read and analyze. But, I feel that these results, at least promise some hope. There are all sorts of applications where this might benefit people suffering with Scoliosis. I doubt that anyone will every consider this treatment a cure for Scoliosis, but cold laser treatment could provide pain relief and even help with speedier recovery from surgery. I look forward to seeing more on this in the future and I will share my results if I find out any more concerning this treatment. I would also LOVE to get feedback on any of you who have gone through this treatment – what are the benefits you’ve experienced (or lack of benefit?). We won’t be trying this treatment ourselves anytime soon, but it is nice to know that we might have a viable pain relief option for whatever the future holds. One of the reason I call my blog “Scoliosis Family Adventures” is because we really like taking adventures. I love to travel and try to do so as much as possible, as cheaply as possible. About a year and a half ago, my brother (whom I am very close with) and his wife moved across the entire country, after being in our State about 14 years. I was very sad to see them go, but it gave us an opportunity to visit a new place – Seattle! I only had enough frequent flier miles to take two of us, so I decided that it would be a reward trip for my daughter for all of her hard work and diligence with her exercises, brace, etc. She’s been so diligent in taking ownership of her health care, that I thought it would be fitting to reward that maturity. We had a great time, and one highlight was visiting the town of Forks, WA, home of the Twilight books. The drive from Seattle to Forks was about 4 hours, but just full of majestic and amazing views! I was so grateful to my brother for doing all that driving! I told him he got “Best Uncle in the World” award for that (at least for that weekend) 🙂 My daughter was so excited to take 5 whole days off from her Scoliosis workout regimen! I even wrote “off” in all the boxes of her exercise chart for that week! She was thrilled. Now we are both back and getting settled back into our routine. I urge everyone dealing with health conditions to find a way to take a vacation from all of it! Even if it’s a “staycation” – we all need a break from our regimen once in a while. If you stay diligent 99% of the time, then once in a while you can just relax and enjoy the refreshing change of pace that a vacation allows. 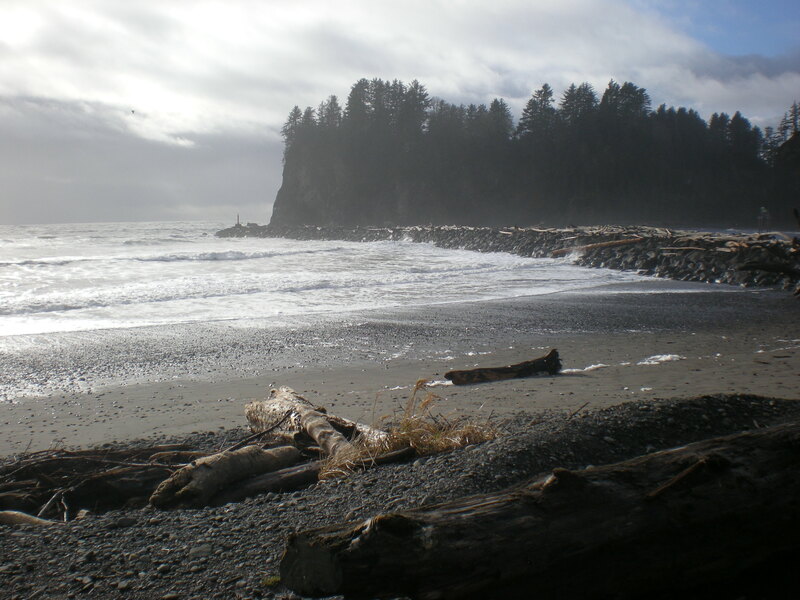 I’ve put a photo below of one of our highlights of the trip – First Beach at La Push Quileute Indian Reservation. An amazing place!